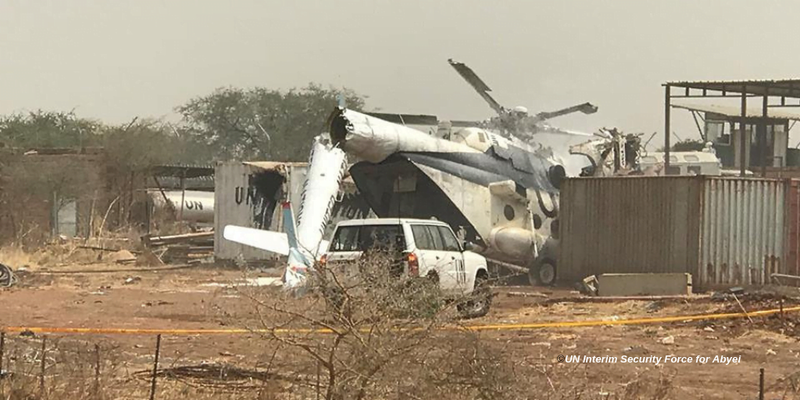 Addis Abeba, February 09/2019 – An Ethiopian military helicopter registration Number UNO 379P with 23 passengers on board has crashed today at around 1310H inside the compound of the United Nations Interim Security Force for Abyei (UNISFA) killing three of its crew members. The MI-8 helicopter was on routine operation carrying Ethiopian troops on rotation from Kadugli to Abyei when it crashed. Ten passengers were injured with three in critical condition. The three who are in critical condition have been conveyed to Kadugli en route to Addis Abeba while those not in critical condition are being stabilized at the UNISFA Level II hospital in Abyei.